Compact D-gasser Working Principle: The degasser is a vacuum-type one, that is, by dint of the suction effect of vacuum pump, negative pressure space is created in vacuum container, and under the effect of atmospheric pressure, the mud enters the hollow shaft of rotor via suction pipe and then spurts onto the container wall from the windows in hollow shaft. For collision and separation wheels, the drilling fluid is separated into thin layers, the bubbles in mud break and the gas escapes. 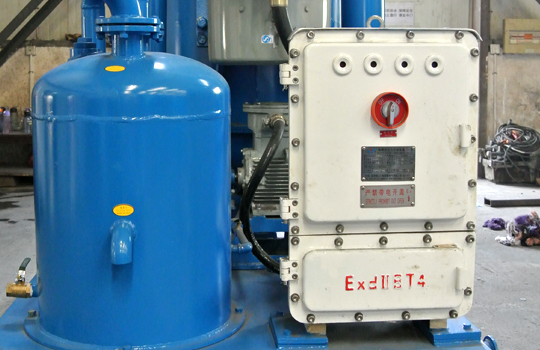 Through suction of vacuum pump and separation of gas-water separator, the gas is exhausted to safety zone via exhaust pipe of separator and the mud is discharged out of the container by the impeller. 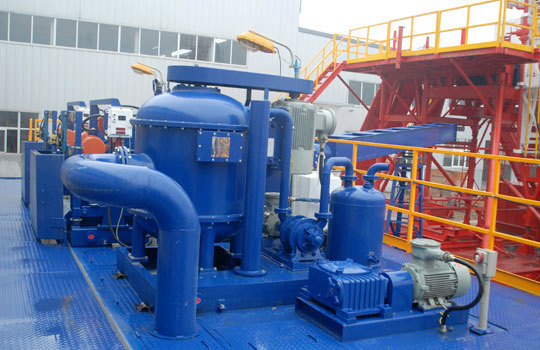 Since the main motor first starts and the impeller rotates in a high speed, the mud enters the container only via the suction pipe, not via drain pipe. 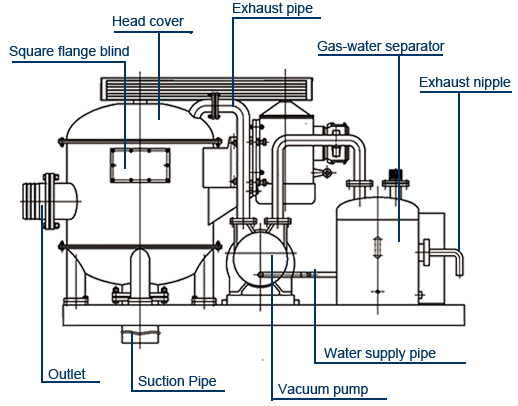 1Absorbing the waste gas with its own power unit independently, without the extra centrifugal pump. 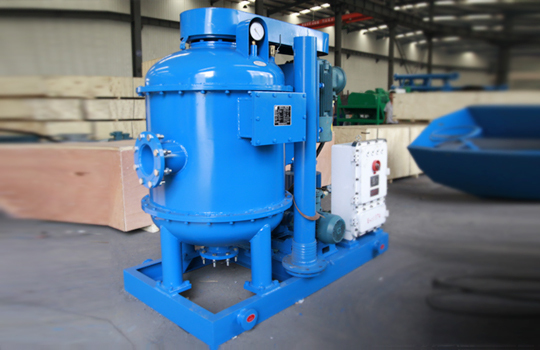 2Can act as a big agitator for the drilling mud, which helps the treatment for desander and desilter. 3Eliminating the corrosion for the solid control equipment, reducing the cost for the maintenance. 1. 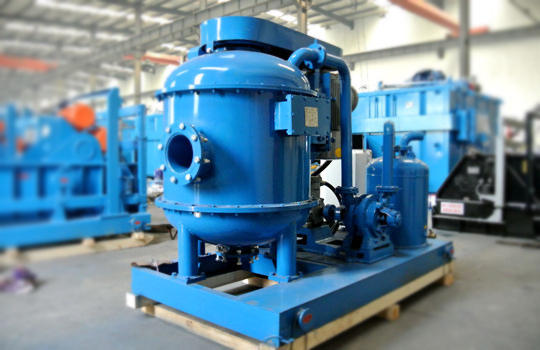 No water or no enough water is in vacuum pump, so rotating water ring cannot be formed. 2. The excessive clearance exists between two end faces of impeller. 3. The temperature in pump is too high. 4. Leaking exists at bolt joints or in exhaust pipeline. 5. Not immerse suction pipe or exhaust pipe into mud. 1. Inject water into pump and adjust ball valve on water injection pipe. 2. Decrease paper washers or replace impeller to adjust clearance. 4. 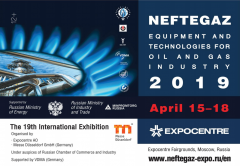 Fasten bolts or seal up leakage of exhaust pipe. 5. Immerse them into mud. 1. Too much water in pump. 2. Impeller cannot automatically adjust its clearance along shaft sleeve. 2. Open pump cover, take down impeller, adjust clearance and then install them. 1. 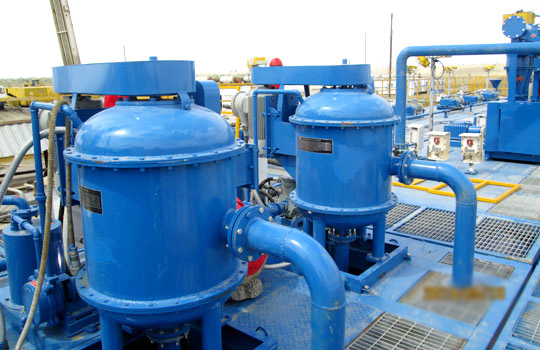 Damages or solid particles in pumps. 2. Foreign bodies enters vacuum container. 1. Open pump head and wash pump. If any, replace the damaged. 2. Open square flange or bottom cover to eliminate them. East-west Rd. No.3 South, Jingwei Industrial Park, Hi-tech, Development Zone, Xi'an City, Shaanxi, China.